If there is one thing you can count on in Aurora it’s great views of the Rocky Mountains. Those snow capped peaks are the first thing that out of town guests notice. They’re also what makes living in this Colorado community so appealing. For the most part, Mother Nature takes care of the mountain ranges surrounding Aurora but that doesn’t mean that humans can’t get in the way to mess things up. It seems that any national park that attracts visitors will also attract messes. Over at Mount Everest, climbers pay for the privilege of scaling that mountain but they also leave behind oxygen canisters, torn tents and all kinds of trash that is frozen. Closer to home, Yellowstone Park holds an annual cleanup day where volunteers remove upwards of a ton of trash every year. Think about that: A ton of trash at a park left behind by folks who made trek because the park is so beautiful. What about your own immediate surroundings? Are there some things around your home that you could do without? If so, then you need to call Junk King Denver. Junk King are the junk removal specialists that have been serving the Denver Colorado area for a couple of years. In that time they’ve helped many satisfied home and business owners clear out the clutter from their property. It’s a safe bet you’ve got a bunch of stuff you can get rid of. These would be the bulky items you can’t throw out in the trash. These are the kinds of things that are stopping you from having a clean basement or letting your park your car in the garage. Too often we turn unused spaces in our home into storage lockers. That’s fine for the occasional “overflow” but when your junk has completely taken over then it’s time to call Junk King Denver to get rid of it once and for all! When you hire Junk King you’re actually hiring a two-man crew and a huge truck but don’t worry about paying for all of that. You’re only going to be charged by the amount of space your junk takes up in the JK truck. No labor costs or dumping fees. It’s a straight up charge that you’ll agree on before any work is done. Those fair Junk King pricing policies are top of the list as to why so many people hire the company. It’s also the dependable service. Junk King knows how busy you are and they’re not going to waste your time. On the day of your removal appointment you’ll be given a two-hour window. When the crew is close they’ll call to let you know. You’ll be amazed at how fast they’ll be able to clean up all your junk. Call Junk King Denver today to find out how they can help you can clean up your home. This entry was posted in Aurora Junk Removal, Denver Junk Removal and tagged Aurora CO Junk Removal, Aurora Hauling, Aurora Junk Removal on July 31, 2013 by Paul Durant. Last updated August 1, 2017 . Ask anybody who’s been to Denver and they’ll tell you it’s a town with a big heart. Best of all, that “heart” isn’t limited to the Denver area. Recently a bunch of Denver residents packed up their gear and traveled to Oklahoma City to volunteer for tornado cleanup. It seems like not a week goes by without a severe storm ripping through some part of the country. These storms can leave a lot of destruction in their wake and the need for volunteer cleaners is great. For this last clean up mission, the Denver volunteers were housed at the City Rescue Mission. This was the place set aside to house volunteers from all over the country and provide them with showers, meals and a bed to sleep in. Even though the Denver group only stayed for a week, their efforts when a long way towards showing the victims of this latest storm that they weren’t alone. The aftermath of a storm isn’t the only time when there is the need for a big cleanup. Your home might just be overrun with junk forcing you to declare, “Enough is enough!” Instead of packing up that junk on your own you can hire Junk King Denver to get the job done right. Junk King of Denver takes all the hassle out of cleaning up your property. That’s because they’re going to be providing you with a capable crew and truck for all the hauling. That crew has not only been professionally trained in the fine art of moving and hauling but they’re also experts in providing you with superior customer service. You only have to show the Junk King crew what you want removed and they’ll handle the rest. If they have to climb down basement stairs or up into the attic you won’t hear a word of complaint. What you will hear is, “What else have you got to throw out?” That could be a very long list indeed especially when it comes to large items. 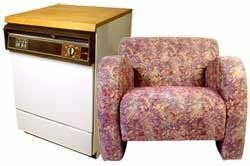 When it comes to getting rid of things like old sofas, mattresses or appliances Junk King is really the safest option. Not only will they load up their truck but they’re also going to make every effort to see that what you’re throwing away is recycled. In many cases that might mean dropping those items off at a charity that does refurbishing. Either way, they want to avoid the local area landfills at all cost and they’re doing a pretty good job at that goal. Whether you have a little or a lot, Junk King Denver is standing by to help turn your home into a clutter free zone. Reach out to them today and see how fast you can get a clean up! This entry was posted in Denver Furniture Pickup, Denver Junk Hauling, Denver Junk Removal, Junk King Denver and tagged Denver Large Item Pickup on July 23, 2013 by Paul Durant. Last updated August 1, 2017 .